RAKI is the national alcoholic beverage of Turkey. Raki is usually served mixed with cold water of about 8-10 degrees Celsius. Raki is similar to Greek Ouzo and French Pastis. hence it's nickname is 'lion's milk'. Raki is sold by 35 and 70 milliliter bottles. Most of the RAKI (rah-kuh) drinkers keep an extra glass of cold water on the side to sip some water immediately after their raki. Raki is always served in short, cylindrical glasses, approximately 5 inches(12-13 cm) high cylindrical glasses. Option II- This is the traditional method which is Raki diluted with an equal volume of water with some ice added, in that precise order. If you add the ice first, then pour raki over it, the mixture becomes crystallized. The color becomes blurry white, distinctly different from the desired milky white. Most importantly, the drink loses flavor. Option III- Prepare RAKI as in Option 2, but take a sip, then hold it in the mouth for a few seconds, then sip a bit of ice cold water. In this way, the two ingredients are mixed slowly in the mouth before swallowing. Unlike wine and beer, which are obtained by fermentation, RAKI (rah-kuh) is produced from distillation. First, raisins are distilled in the normal way, then the product is re distilled with aniseed. RAKI contains 45% alcohol by volume, with a minimum of 65% of the alcohol derived from grape distillate. It can be consumed as a cocktail, but more commonly requires some sort of food, before a nice meal of kabob(s) and/or fish. (Turkish hors d'oeuvres and appetizers) such as; sliced tomatoes and cucumbers, white cheese(equal to Greek feta cheese), fresh green onions with fresh greens in salads, cold eaten vegetables dishes; such as, olive oil cooked grape leave dolmas, fried eggplant, fried thin green peppers and zucchini, olive oil sauteed pinto beans, cacik (garlic flavored cold yogurt salad with diced cucumber), lamb brains salad, fried pastries filled with white cheese (sigara boregi), shrimps, marinated artichoke hearts, eggplant salad, pastirma slices (Turkish pastrami), 'kokarec'(stuffed and grilled lamb intestines), tongue slices, deep fried mussels, diced/sauteed lamb liver, casaba or honeydew melons, ice-cold fresh almonds, roasted chick-peas and available nuts... and the list could truly go on forever. The best way to go about choosing the MEZE you want is to ask to see the mezes and wait for the waiter to bring a huge tray filled with various meze dishes for you to choose from. MEZEs are always served in small amounts with small plates. To take the full advantage of MEZEs you should gather a big group of people around you, so that you can try as many different types of MEZE as possible, and definitely not have any other plans for the rest of the evening! By the way, Raki is one of those rare drinks that needs to be consumed with food only. MEZE is usually followed by entrees such as Shish Kebob, mixed grilled meat steaks, fish, ending finally with fruits and deserts. RAKI is not a fast drinking type of beverage! In the bars and restaurants RAKI serve by a single shot, what is called in Turkish 'TEK' or double shot 'DUBLE'. RAKI is also served by the bottles and bottles comes in two sizes: 35ml & 70ml. Small one called in Turkish 'Kucuk Raki' and big one is 'Buyuk Raki' or in short; 'kucuk' (small) and 'buyuk' (big). as same as they describe in Turkish... man try to steal some time from their regular daily life to have fun. 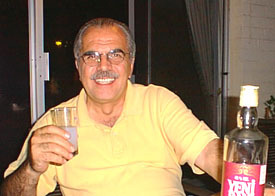 But lately women too are seen drinking RAKI in bars and restaurants during family and friends gatherings. RAKI made in Anatolia is known as TURKISH RAKI. It's history goes back 300 years. In the near and middle east countries similar drink is known by different names such as ARAKA, ARAKI, ARIKI which obviously comes from the same origin. Some claim that it is called IRAQI (from Iraq) because it was first made in that country and spread to other regions. Others say that its name came from the 'razaki grapes' which it is produced from. Another theory is that ARAK in Arabic means 'sweat' and is the thing that makes one sweat. Until recently, Raki was made only by TEKEL. Tekel, (Turkish Government Tobacco and Spirits Monopoly) produces Raki with 3 different quality levels. 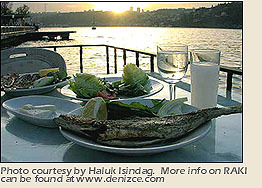 Nowadays some commercial companies in Izmir and other cities started Raki production under variety of name brands. For those of them see bottom of this page. Goverment's brand raki called 'YENI' ('New', in Turkish) is 45% by volume but 'ALTINBAS'(Golden Head) and 'KULUP'(Club) are 50% by volume. Statistics shows that thirsty Turks sip more than 60 million liters... equivalent of 16 million of gallons (US) of RAKI each year. Also Turkey exports RAKI and you can find it in major liqueur store in your country and duty-free shops in most of the airports especially in Europe. TURKISH RAKI is produced only in Turkey and it comes in sizes of bottles 35ml and 70ml. In Turkey, despite the Islamic prohibition against wine and anything alcoholic, YES, there is a rich tradition associated with liquor. Only strictly observant Moslems(Muslims) do not touch alcoholic beverages at all, but all other Turks drink. So, like many Turks, as a tourist, you can find and consume alcoholic beverages almost everywhere. Raki and all other high alcohol proof beverages shouldn't be taken lightly and and requires some initiation by drinking with responsibility. When Turks toast their RAKI, they say 'SEREFE' (share-a-fa)! When you visit Turkey we hope you get experience with RAKI and enjoy!